Last November 5, 2015 two dams collapsed in the city of Mariana, in Minas Gerais state in Brazil. These dams belongs to Samarco, a joint-venture of Vale and BHP Billiton giant mining global corporations. These dams were used as a reservoir for toxic waste from mining operations in the area dissolved into muddy water. All waterways around Rio Doce basin, a critical river which crosses several cities both in eastern Minas Gerais and Espirito Santo states and flows into the Atlantic ocean, are taken by toxic mud. These muddy waters affected seventy-two kilometers of Atlantic shore and advanced 18 kilometers into the ocean. The first to be affected were the inhabitants of Bento Rodrigues, a tiny and poor working class district of Mariana. Fifteen were killed, four are missing, and all others were displaced. All 180 homes were lost. At least 317,000 people are affected by lack of clean water and job losses. Three tons of dead fish were collected along Rio Doce ; several alligators, capybaras, otters, cattle, dogs and migrating birds died ; twenty turtle nests were removed from the shore around Rio Doce mouth. A UN report exposes the depth of consequences for human beings and nature, and the lack of support for all the people affected (http://www.wsj.com/articles/brazil-dams-failure-flooded-region-with-toxic-wastes-u-n-report-says-1448494712). 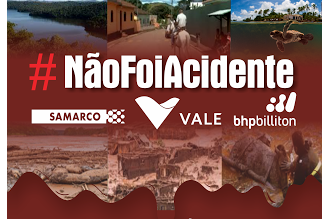 Labor, people’s movement and environmental groups are together in blaming Vale, BHP Billiton and Brazilian authorities who calls this catastrophe a mere accident. The reality is that profits are above any other human or environmental concern. It is cheaper to pay bribes to authorities and eventual indemnities after a disaster than to invest in safe and environmental sustainable mining conditions. Brazil has become the main exporter of iron ore for steel mills across the world. There are more than 400 dams containing toxic waste in Minas Gerais state alone. New “accidents” will happen for sure. Metabase, the trade-union who represents mine workers in the nearby cities of Ouro Preto, Congonhas do Campo e Inconfidentes is together with other people organizations calling a national labor and peoples’ meeting to address both immediate and long-term demands of Rio Doce valley working people. It will be held in December 17, 2015 in the city of Mariana in Minas Gerais state. 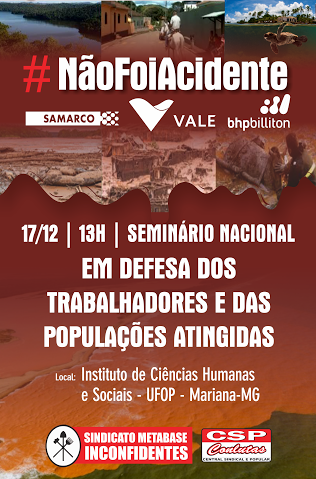 An international campaign to make Vale and BHP Billiton responsible for their actions is on the agenda, together with demands on Brazilian authorities to set a new mining code (national legislation) that obliges the mining corporations to invest in safety and environment. The CSP-Conlutas, a Brazilian labor and people’s federation, supports this meeting and invites international labor to join this struggle.